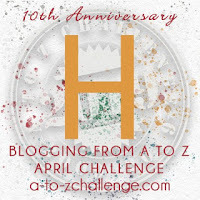 Since I am writing these posts ahead of time, today is April 4 and I am writing the H post. This post won't come out until 9th. April 4th is one of the most important days of my life. Forty-four years ago I gave birth to my son Joseph Christoper on this day. The list of Joe-ness is endless. Shy, kind and gentle. Guitar player and eclectic music lover. A dry sense of humor bordering on the absurd. Most important a loving husband and wonderful father. In fact I started this blog for Joe. 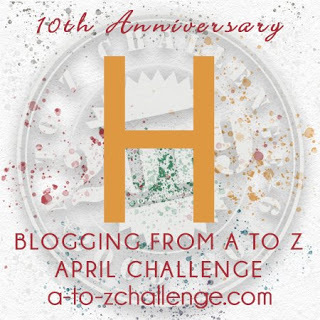 I published my first post on March 10th. It was a hopeful post. During the next 10 months of that year, as each month came and went, so did my hope turn to despair and finally the most heart wrenching sadness and grief I have ever felt. On this day, this April 4th day, the day Joe would have celebrated his 44th birthday, my thoughts naturally turn to imagining how today would should have been. Actually, today I probably would not have seen Joe. That's because it's opening day and particularly Mets Baseball opening day. Joe was the most loyal Mets Fan. Opening day on Joe's birthday - 4/4 and he would have been 44. Oh for sure Joe would have been at the game. Joe's wife, Anne and son have carried on the Mets fan tradition. Domani, Joe's son is a most loyal Mets fan. 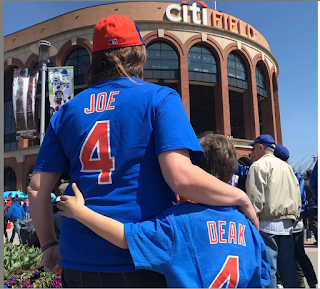 Today, Anne and Domani are at the Mets game, on Joe's Birthday On 4/4 and what would have been his 44th birthday. Happy belated birthday Joe! Oh how it would have been fun for 44 on April 4th at the game! It is good his wife and son went with their special remembrance of him. I hope the Mets won?? Thank you Betty. By the way, the Mets lost 4-0. Happy birthday to Joe. My brother turned 44 this year. On March 30th. I had no idea your son and my brother were nearly the same age. Did you know 4/4 is a doomsday? There's a calendar trick. It's a calculation that Lewis Carroll (the author of Alice in Wonderland) came up with. Each year is associated with a day of the week. For 2019, it's Thursday. The doomsdays all fall on Thursday this year. Also doomsdays: the 4th of July, Halloween, the day after Christmas, 6/6, 8/8, 10/10, 12/12. Yes, this is silly random trivia. Well you brother and my nephew share a birthday and he also turned 44 that day.